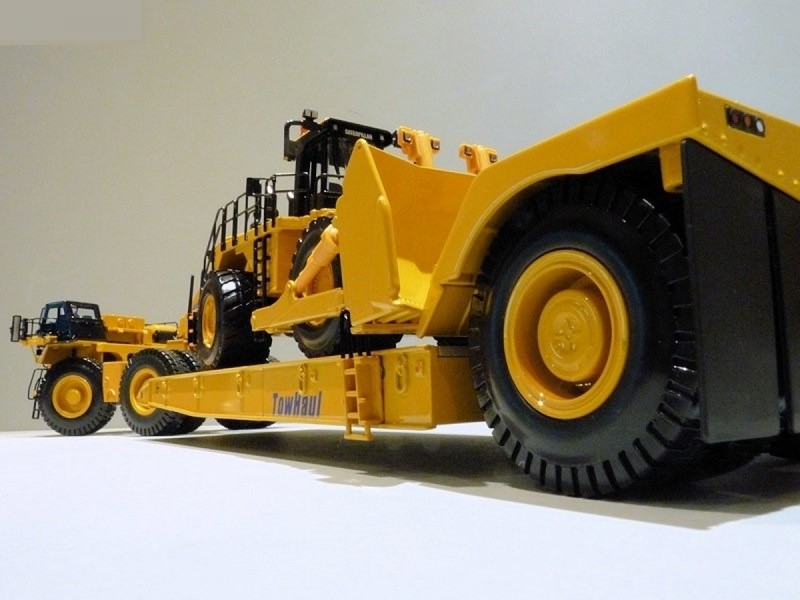 The TowHaul Corporation is based in Montana in the USA and has been making mining lowboy trucks since 1977. The Caterpillar 784C and TowHaul trailer is a massive machine used to move large mining equipment off-road within opencast mines. 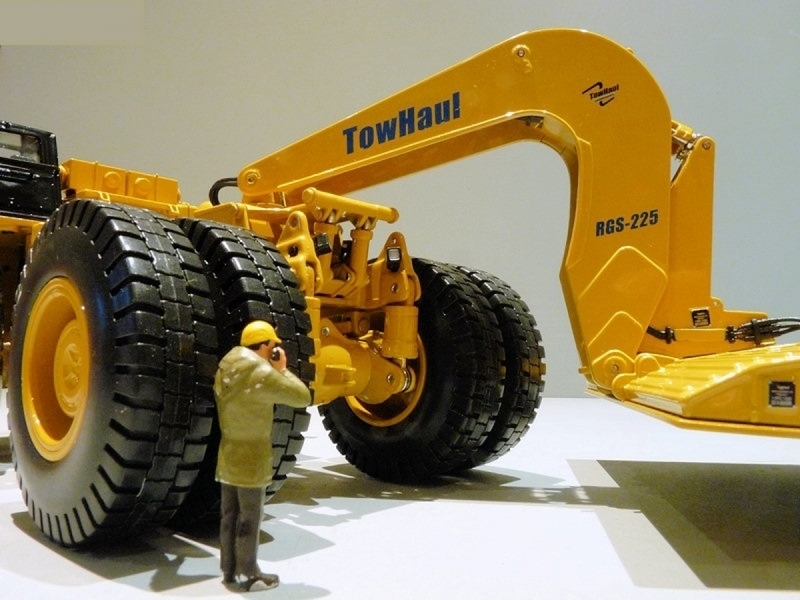 The trailer modelled is an RGS-225-48-20 unit and has a 225 US ton capacity. 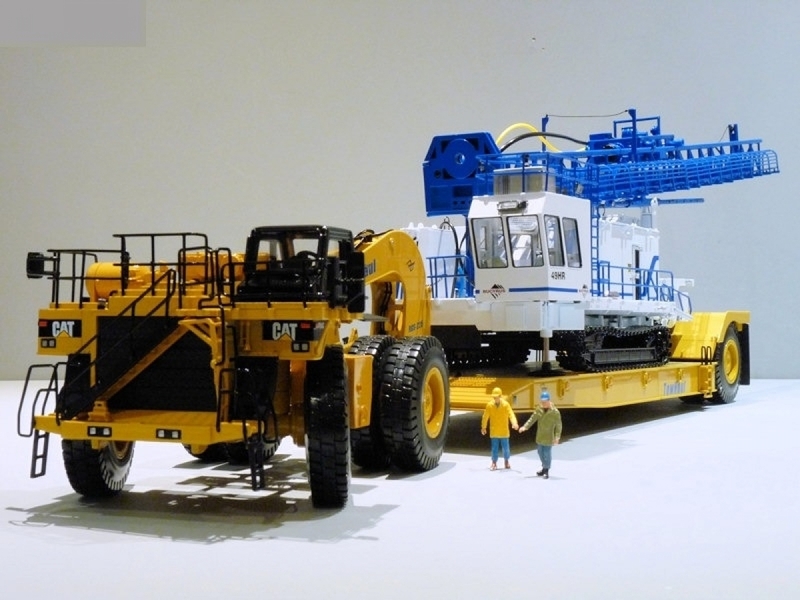 The model comes in the usual Caterpillar box style with a window, but it is on a grand scale measuring over 80cm long. The model is secured inside between clear plastic formers and tied through to the cardboard base by the ties favoured by Norscot. 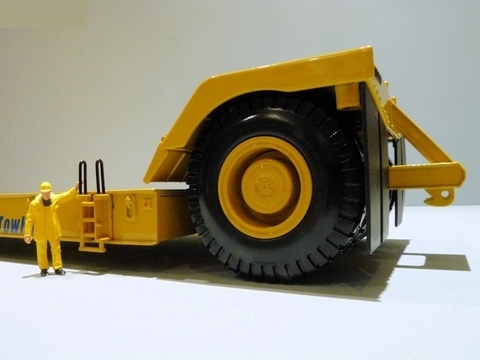 The review model had no defects or missing parts. It is good to see that the box has a photo of the real trailer and there are some details of both the trailer and the model. 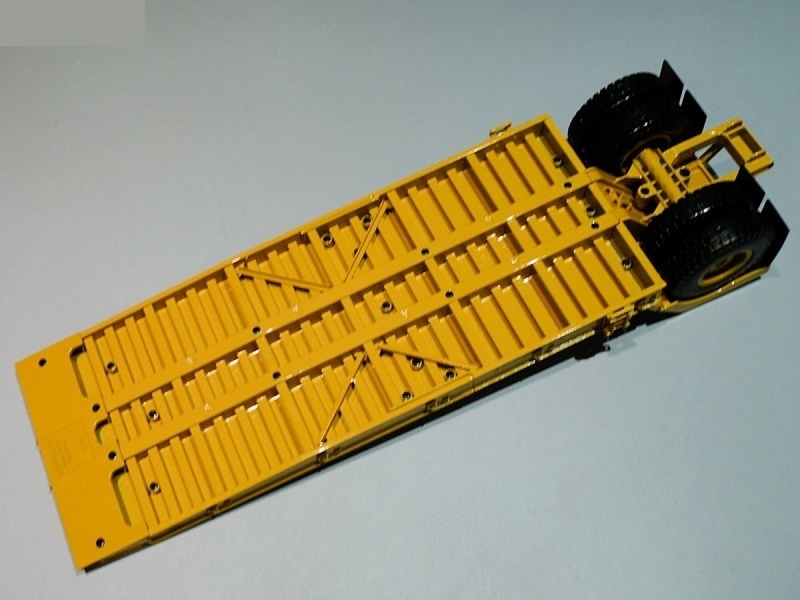 An instruction sheet is supplied which explains the connection of tractor and trailer and the use of the clip which is supplied to help maintain the trailer bed off the ground. The tyres are the same on the tractor and trailer and are made of slightly shiny rubber, although the tread pattern is fine. The hubs are quite good plastic parts with an excellent colour match to the rest of the model and with the fine detailing that plastic allows. 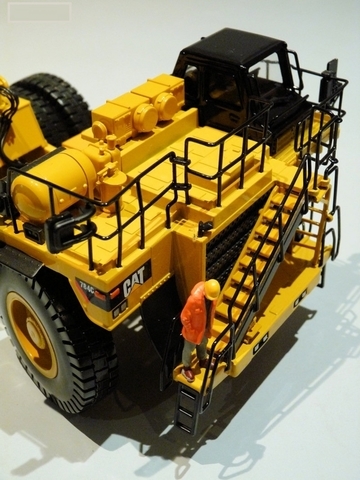 Underneath, the tractor has a heavy construction but there is a gap where the engine would be, and although this was not much of an issue on the 785C Mining Truck, it is more relevant here because from many views it is quite obvious that there is no engine block which is a shame. Plastic is used for the tanks between the wheels, and the colour match is again excellent so it does not show. The front of the model is impressive with lots of fine metal handrails. The ladders and stairs are plastic, as is the other equipment on the cab deck, and the main radiator grille at the front, but they all look good. The driving cab is metal with some interior detail, and it also has metal grab rails and a windscreen wiper. A pair of large driving mirrors are positioned on each side of the truck. 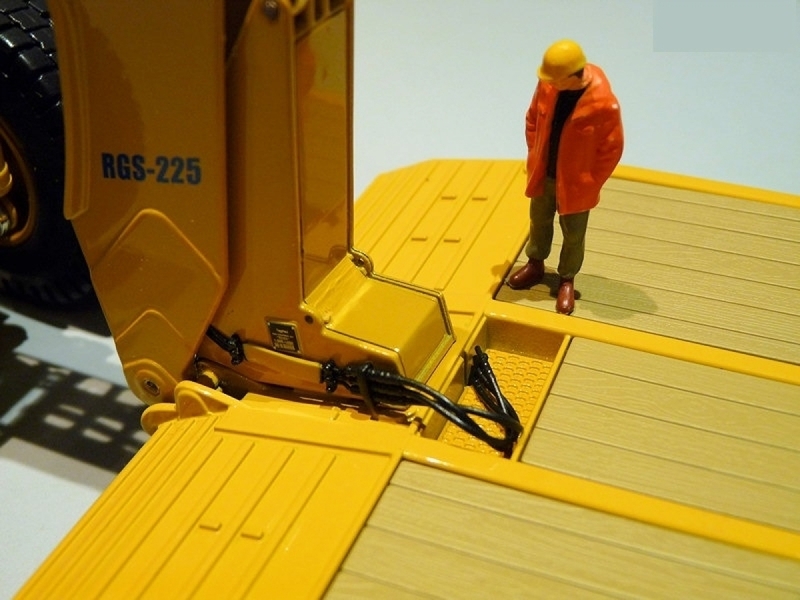 There is some nice small detailing such as the air horns below the driver's cab. At the rear, the suspension is modelled well. A gooseneck is used for attaching the trailer and it is a detailed piece with lots of hydraulic lines. 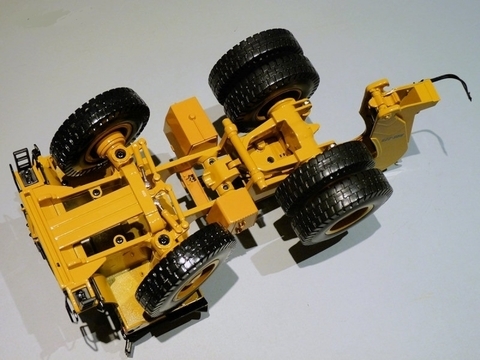 The mechanism for lifting the gooseneck is nicely replicated, and the connection to the trailer works well. The TowHaul trailer is a heavyweight piece of modelling. Underneath, the structure is well modelled and the desk surface is made of plastic which is finely grained to represent timbers. The edge beams have tying loops modelled within the casting but they are not useable and it would have been really good if loads could have been realistically tied to the trailer. At the rear end are a couple of access ladders and there are very nice rubber mud flaps. The front end has well modelled nosing ramps and there is an extraordinarily small nameplate which has some of the smallest legible writing you are likely to find. The tractor steering works well and has quite a reasonable range of movement. 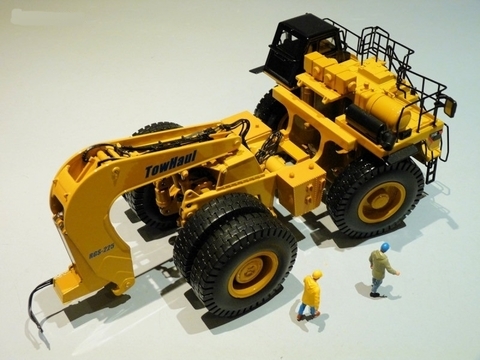 Its rear axle has a good suspension mechanism which allows either independent oscillation or both wheels to move together. The mirror opposite the driver's cab can be folded in for transport, but not the driver's side mirror. 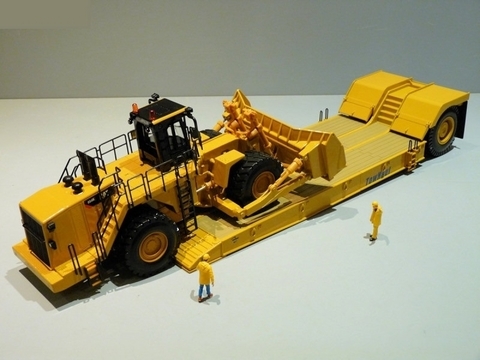 The gooseneck can be elevated clear of the ground when not connected to the trailer by some very stiff small hydraulic cylinders. When connected to the trailer, the main hydraulic cylinders are not strong enough to hold the trailer clear of the deck so a special clip is provided which clips on to the pistons to maintain them open. This works well. 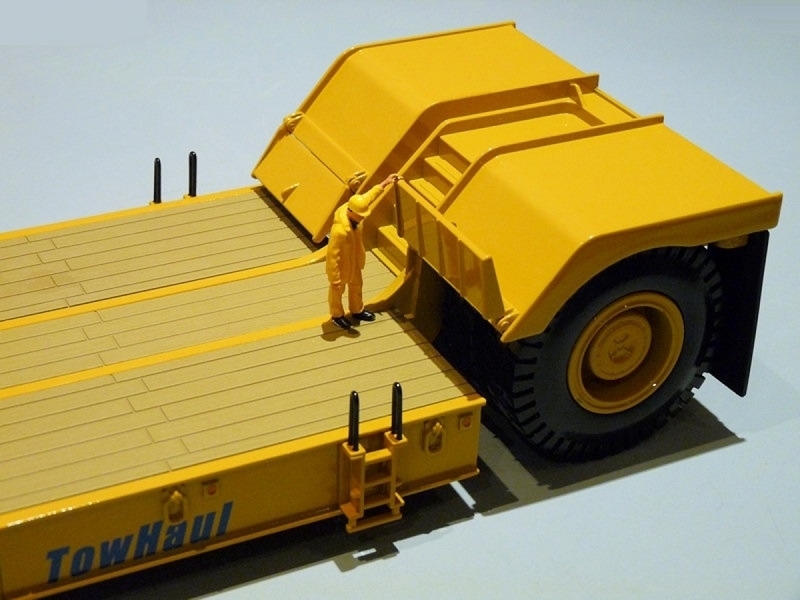 The TowHaul trailer has opening flaps just in front of the rear axle to provide access to the wheels, like on the real machine. 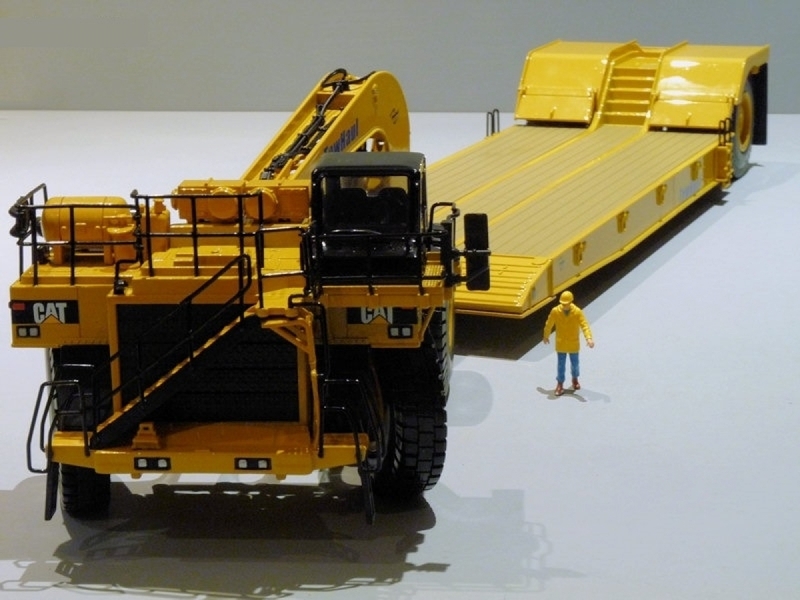 This model is certainly solid and robust, the trailer particularly so. 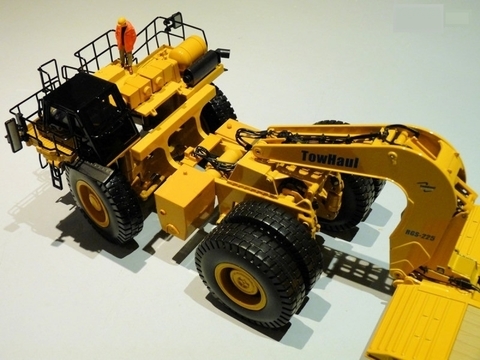 The plastic used is good quality and the colour match is excellent so the look of the model is not impaired. The paintwork and graphics are also very good, with the tiny nameplates on the trailer and gooseneck a high point.